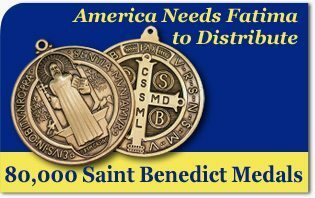 On June 29, American Needs Fatima (ANF) will mail 80,000 Saint Benedict medals to its friends and supporters as part of its Public Square Rosary campaign. The Saint Benedict Medal is considered the most powerful medal in the Catholic Church. It is exorcistic and strengthens souls who are tempted. The medal, as it is known today, was first made in 1880 by the Benedictines of Monte Casino to celebrate the 1400th anniversary of Saint Benedict’s birth. Mindful of the medal’s exorcistic powers, ANF hopes they will protect Public Square Rosary participants from attacks of the devil. 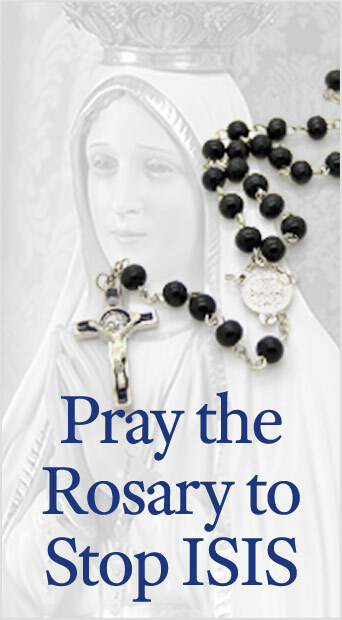 This is important, since the devil hates the rosary. Through its recitation, his pride is defeated. Thus, he loathes its public recitation even more. It is one more wound to his pride and a jab in his eye. Through the intercession of the Blessed Mother and Saint Benedict, the medal will serve as the walls of a castle in defense of those who honor her in the public square. May those who receive the medal correspond to the graces it brings them. This entry was posted in Events of 2007 and tagged America Needs Fatima to Distribute 80, Blessed Mother, defeated, devil, ecorcistic, friends, loathes, medal, Monte Casino, pride, Public Square Rosary Rally, Saint Benedict Medals, supporters by TFP.org. Bookmark the permalink.